John Van Benschoten's struggles finally caught up with him. The Cubs got to JVB right from the beginning tonight, and sent him to the showers after only 2.2 innings. Van Benschoten allowed five runs on seven hits, striking out two and walking three. John Wasdin relieved him and allowed two more runs, spotting the Cubs a 7-0 lead through five innings. 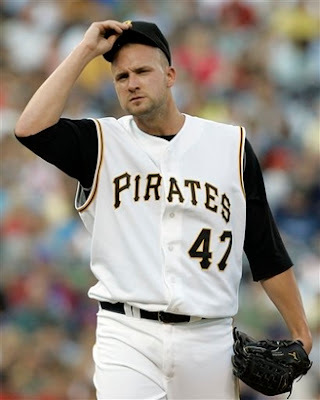 Ted Lilly quieted the surging Pirate offense, allowing only one run through 7.1 innings. He also added an RBI single of his own. Final score, 7-1. Adam LaRoche was a late scratch due to a sore knee, and likely will sit out tomorrow's game as well. Josh Phelps took his place at first, and struck out looking three times. Awesome. Of the 33,293 in attendance, a large portion were fans of the visiting Chicago Cubs. While it is disheartening to be beaten so easily, it is absolutely infuriating to do so while surrounded by out-of-town fans. I would like to thank the Chicago Cubs for ruining beach towel night for me. There will be no warm memories from this game. All that I have gained from this night is another cheap Pirate towel that is one or two washings from being completely useless. If you think it's bad this weekend, you should see it in Milwaukee when the Cubs are in town. I went there a few years ago with one of my ex-girlfriend Cubs fan. I purposely wore a Brewers hat (that I got for free when I went there a few years earlier) and cheered for the Brewers. I was in a very small minority that day. But lucky for me, the Brewers won. The real downside was paying an inflated ticket price (the prices are higher when Cubs are visiting).